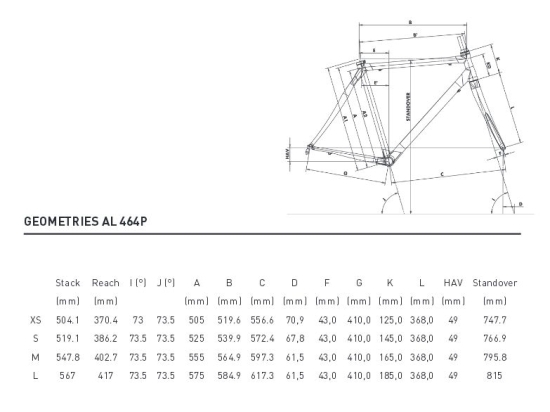 The use of upper range aluminium allows making a “track school” frame the geometry of which is very close to carbon frames such as the 496 and 596 that have skimmed the podiums for years now tout while respecting a much lower budget. Thus beginner track cyclists can benefit of all the know-how of LOOK as far as the geometry of its products is concerned to carry out their activity under the best conditions. It is as if the whole experience of LOOK for track sponsoring with the best athletes in the world was resumed in this frame. The diagonal tube is oversized to increase the frame’s rigidity. Its drop of water shape ensures for its part good aerodynamic performances. The fork of the AL 464 P is a 100% carbon fork (pivot included). It is both lightweight and ultra-resistant. Its carbon composition benefits of special reinforcements for its use on the track. Its lateral rigidity has been notably increased. It also approaches an aerodynamic profile with branch sections creating minimum turbulences. This fork meets the European standard EN 14781 (frontal shock of 144 joules).